Signals from most growth factors and cytokines are transduced by receptor tyrosine kinases or non-receptortyrosine kinases. Activated tyrosine kinases phosphorylatetheir substrates, which mediate the cellular response to extracellular stimuli. A long-sought major substrate termed p62dok (downstream of tyrosine kinase) for many tyrosine kinases including c-kit, v-abl, v-Fps, v-Src, v-Fms, and activated EGF, PDGF, IGF, VEGF and insulin receptors was identified recently from human and mouse by several laboratories. Upon phosphorylation, p62dok forms a complex with the ras GTPase-activating protein (RasGAP). 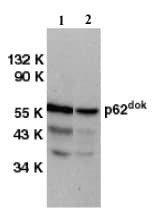 p62dok represents a new family with very recently identified p56 dok. Our Abpromise guarantee covers the use of ab8112 in the following tested applications. WB Use a concentration of 0.5 - 1 µg/ml. Detects a band of approximately 62 kDa.Can be blocked with Human DOK1 peptide (ab39756). IP Use at an assay dependent dilution. (see Abreview published on 27th July, 2006). DOK proteins are enzymatically inert adaptor or scaffolding proteins. They provide a docking platform for the assembly of multimolecular signaling complexes. DOK1 appears to be a negative regulator of the insulin signaling pathway. Modulates integrin activation by competing with talin for the same binding site on ITGB3. 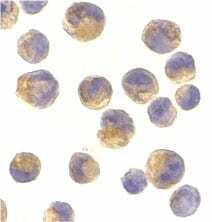 Expressed in pancreas, heart, leukocyte and spleen. Expressed in both resting and activated peripheral blood T-cells. Phosphorylated on tyrosine residues by the insulin receptor kinase. Results in the negative regulation of the insulin signaling pathway. Cytoplasm and Cytoplasm > perinuclear region. Publishing research using ab8112? Please let us know so that we can cite the reference in this datasheet.